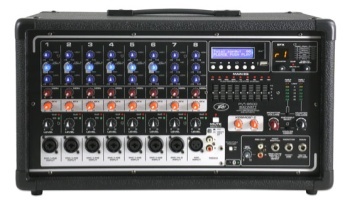 The Peavey PVi 8500 /PV 8500 is a revolutionary all-in-one powered mixer with everything a musician needs: up to eight combination XLR and 1/4" inputs using Peavey's awardwinning mic preamps, and 400 watts of peak power for crystal-clear audio reproduction. The Peavey PVi 8500 / PV8500 uses exclusive and patented features like Mid Morph® to accurately help improve tone and clarity of vocals. Feedback is quickly and easily identified and removed with Peavey's nine-band graphic EQ combined with our patented and revolutionary FLS® Feedback Locating System. The PVi 8500 / PV8500 is equipped with Peavey's exclusive Kosmos®-C technology, which drastically enhances both the low and high end of the audio spectrum. Footswitchable, built-in 24-bit digital effects complements the already feature-packed unit. Connect virtually any music device to this versatile mixer via the onboard 1/4", RCA and 1/8" mini jacks. Master Mute for channels 1-7. Combination XLR and 1/4" input jacks. Selectable 9-Band Graphic EQ with FLS. Selectable Main or Monitor dual power section. On-board 24- bit digital effects with mute button. Clip light and signal present indicator. Main line level 1/4" output. Weight Unpacked: 23.02 lb(10.44 kg). Weight Packed: 26.01 lb(11.8 kg). Width Packed: 14"(35.56 cm). Height Packed: 22"(55.88 cm). Depth Packed: 13.75"(34.925 cm).